I’m working all day today and haven’t had time for any adventures. Eleanor and Emma are over at Janie Haddaway’s doing laundry, so they are working too. 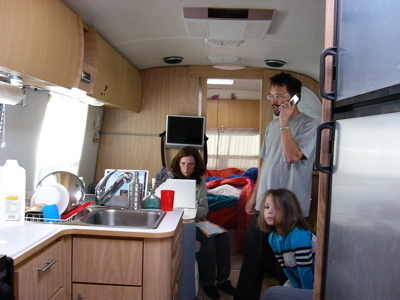 Since we don’t have any exciting news, I thought I’d share a few photos of us having a typical day in the Airstream. These photos were taken by Andy, who visited us back in Tucson a few weeks ago. He caught us candidly doing the things we do every day. Every morning the trailer is filled with hubbub. Usually one or both of are working on the computer, and I’m often pacing around talking on the phone. 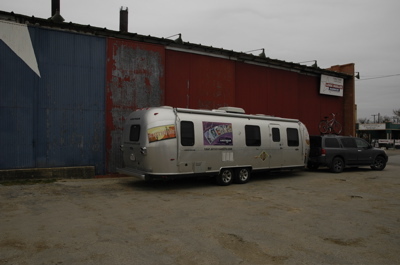 When you call Airstream Life magazine, and you hear noises in the background, just remember this picture of my “office”. 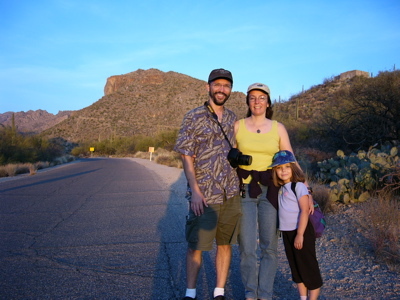 Andy was with us on our hike to Sabino Canyon and I’m really grateful that he took a few pictures of us together. We hardly have any good shots of us as a family. This hike in Sabino Canyon is a treasured memory. 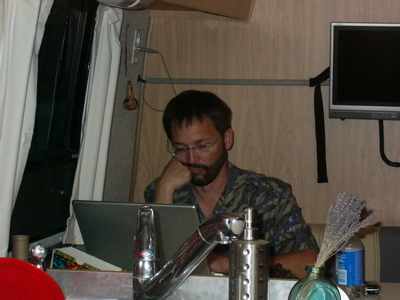 And here I am at the end of a typical day, taking care of subscriber inquiries that came during the day, downloading my photos, and writing up a blog entry for you to read. We are planning to stay here at NTAC for a couple more days, and then I think we will head over to Roger Williams Airstream in Weatherford for some minor repairs. After that, I am leaning toward visiting Hot Springs National Park on our way north to Indiana, rather than heading west to Mississippi. The more direct route will give us more time to stop along the way. We spent the morning catching up on work but when we finally poked our heads out we met two neighbors right away. NTAC is a friendly place and everyone wants to say hello and offer something: laundry machines, lunch, a place to work, directions. It feels like a rally all the time. There is an Airstream in every garage, literally. 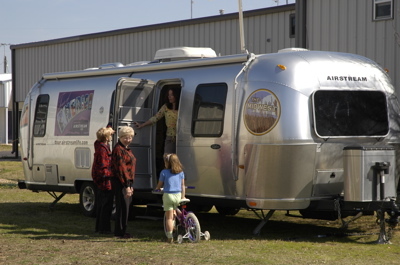 NTAC is a gated community of villas, “RV port” homes, and grassy lots, each with full hookups for an Airstream. People lease the lots and own the improvements. Most are second homes, but for some people they are their primary residence. By the way, any Airstream owner can visit here. You don’t have to be a member of WBCCI. Normally you’d be parked in the gravel lot, but since we are courtesy parking, we are parked on grass between two houses just up from the clubhouse. Our host has told us we can stay as long as we like, which is very good for our budget. NTAC is across the way from the town of Hillsboro, which is centered on a mammoth French Second Empire courthouse. 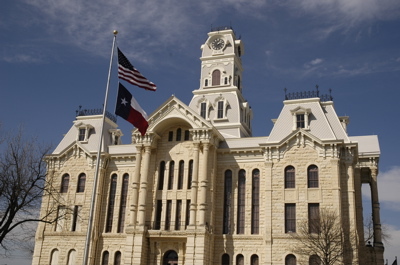 I’ve spotted two of these courthouses in Texas so far (the second one being in Weatherford). Jim and Janie Haddaway invited us to their NTAC villa for dinner this evening before my scheduled talk about our travels. We feasted on “taco soup” — a Texas dinner, I’m told. Jim is a past International President of the WBCCI, and we were joined by Dr Earl Elam, the current president of the NTAC Board of Directors, and his wife Eleanor. At 7 pm I presented a slide show about our travels to about 25 community members. I picked out 160 slides from the thousands in my albums, and talked about where we’ve been, how we live, and what we do. Although that sounds like a lot of slides, we were done in 90 minutes and everyone seemed to like it. 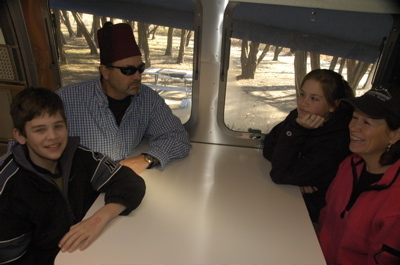 People are always curious about us since we are a bit of a anomaly as full-timers who aren’t retired, and traveling with a child. In short, NTAC has rolled out the red carpet for us and we are having a fine time, so we’ll be here for a couple more days at least. I’ve got plenty of work to do, and tomorrow I’m on the program for the Computer Rally going on this week, speaking on “Getting Online While Mobile.” Emma wants to ride her bicycle and Eleanor is going to catch up on laundry. We’ll also do some research and figure out where we’re going between here and Indiana. I’m leaning toward Natchez Trace Parkway but I’m not sure we’ll have time to do it properly. Now that was the right way to run a rally “¦ er, “campout”. The Heart of Texas Unit really has a great way of doing things. We had the most relaxing Saturday, and a great time despite the fact that it rained nearly all day. 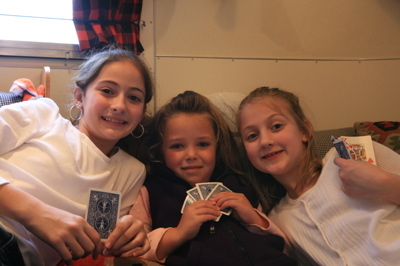 Emma and her newfound friends spent the entire day together, playing card games in their ’67 Caravel, and getting into mud by the lakeside. We got her back at dinnertime, soaked, covered in mud, and as happy as a five-year-old can be. I spent the morning sleeping. After my dawn breakfast, I decided to go back to bed, and didn’t wake up until 11! By then, breakfast was over but everyone was still out under the canopy talking, so I just showed up and nobody questioned where I’d been all morning. Eleanor and I ended up with David Tidmore in our trailer all afternoon, exchanging Airstream knowledge and planning some of our trailer upgrades. David is a man of ideas and he knows how to execute them. In a few hours, he had me convinced to upgrade to disc brakes, re-wire my trailer for more efficient charging, and add solar. He also showed me the upgrades his dealership has done for other members, some of which are pretty clever, and he pitched me on switching to a Hensley Arrow hitch. We pitched him on our ideas to change some of our cabinetry, upgrade two of the windows, and possibly add a Vista View window. We’re going to keep talking this week about those projects. Saturday’s dinner was an incredible Mexican-themed potluck. People in this unit really know how to cook. I was amazed at the quality. By dinnertime, a cold front had blown through and cleared out the rain, so it was cool but still nice enough to eat outside with a jacket on. Emma and her friends came over at 8:30 to watch “The Princess Bride” on our TV and I made a big batch of popcorn for them, while Eleanor spent the evening out in our folks’ trailers looking at pictures and exchanging travel ideas. In short, we had a great day. Today was nice too “¦ a casual morning with breakfast at 9:00 or so, plenty of sunshine and chat, then I roamed around taking photos for future articles. 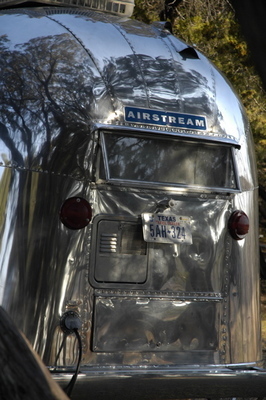 In the afternoon we headed over to North Texas Airstream Community in Hillsboro and that’s where we are right now. I’ll tell you all about that this week. We are finally at the first organized rally since we started traveling in October. The new “Heart of Texas” unit of the WBCCI invited us to join them in here for a “campout”, and so we slogged for four hours through the biggest rainstorm Texas has seen in months to get here. I am certain it will be worth it. There are about eight or nine Airstreams parked with us beside a little lake, ranging from a nice ’67 Caravel to a polished Classic 280 Turbodiesel motorhome and several newer units. Two of the couples besides us brought their young kids! That’s a rare event indeed for most WBCCI events (but the norm for this new unit). Of course Emma is thrilled with her new friends, even though they are all a bit older than her. By nine o’clock she had been adopted by the other kids and was off playing flashlight tag in the dark. A couple of people were kind enough to say that they made an extra effort to come because David Tidmore, president of this unit, told them we were coming. They all want to hear about our travels, even the people who read the blog regularly. It’s really nice to see that people are interested, and so I’m going to try to put together some photos and ideas to share with them this evening. 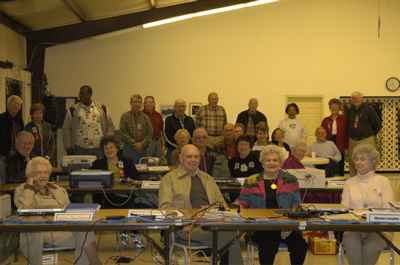 One of the unusual things about the Heart of Texas Unit is that almost all the members are not retired. So they do things a bit differently. The usual WBCCI unit rally includes breakfast on Saturday morning at 7 or 8 a.m., but David stood up last night to announce that as usual, breakfast would be held at “about 9:30″. Given that dinner was set for “about 7″ last night and we didn’t actually get to eating until 8, I figured I’d sleep in and then have brunch with the group. But it has rained hard all night, with thunderstorms, and they woke me up at 6:30 “¦ and I ended up having breakfast alone at 7 while Eleanor and Emma slept blissfully through the patter of rain our aluminum roof. The forecasters say the rain will end today, which is fine with me. The Texans wish it would keep raining, because the state is in a severe drought right now. In my essays on Gather (see link to the left), I talk about how our form of travel allows us authentic and personal experiences that rarely happen when you’re on a typical vacation. We were lucky to have one of those authentic experiences today, in Taylor, TX. Taylor is a quiet place about 30 miles northeast of Austin. The land is flat and open out that way, covered with corn fields and Southern Pacific rail lines which run right through the centers of each town. 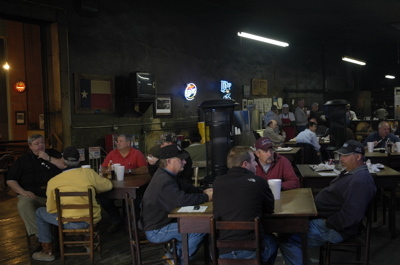 It’s far enough off the beaten path that you wouldn’t expect to see many tourists there, but on weekends, the knowledgeable ones head to downtown Taylor to experience exceptional barbecue, in an area that is already known for great barbecue. Shanta Kuhl, one of the local town boosters, invited us to drop in for lunch at Louie Mueller’s, one of the two great barbecue spots in Taylor. So on our way north to Cleburne, we pulled the Airstream right up to the side of Louie’s and stepped into one of the best culinary experiences we’ve had since we started traveling. 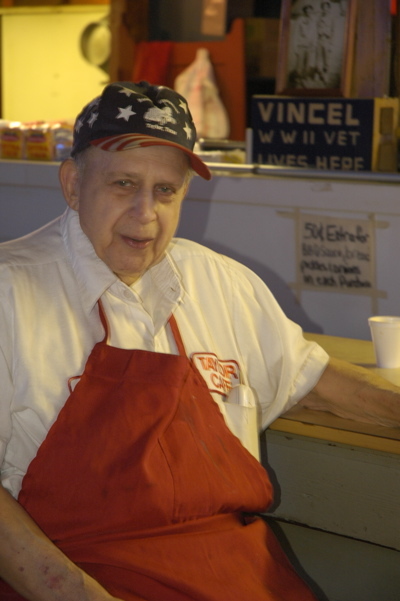 The first thing that struck me about Louie Mueller’s was the character of the place. The dÃ©cor is simple: square wooden tables sitting on a black wood plank floor in a high-ceilinged box of a room that looks like an old warehouse. There’s a bit of neon and a corkboard covered with hundreds of old business cards stained brown with years of grease. An ancient jukebox sits in the corner. At 11:45, the parking lot is filled with pickup trucks and the tables are filled with men wearing baseball caps. The back half of this large open space is filled with black barbecue equipment, looking like an arrangement of steam locomotives, and attended to by a small crew of confident-looking people who start their secret processes at 3 a.m. every day. There’s no table service. The menu is short and to the point, written on paper tacked to the wall: you can get barbecued this or that. I didn’t see any salads or salmon fritters. When you line up at the kitchen counter with your tray, the friendly staff quickly tosses a thumb-sized bit of barbecue beef on the paper liner for you to sample while you’re waiting. Emma wanted ribs, so Eleanor ordered three ribs, expecting those skinny things you usually get at chain restaurants. The crew looked at Emma and explained that their ribs are BIG ““ about a pound of meat on each one. They look like they were taken from a brontosaurus. She got one and there was plenty for Eleanor and I to sample, with leftovers. One thing you should know is that there is no “one” way to make barbecue. Every place is different, which is why sampling the different restaurants is so much fun. You never know exactly how it’s going to taste, but you can be assured it will be darned good, especially out here in the midst of barbecue country. I could see spending a couple of weeks touring this area and dropping in on a different local barbecue spot every couple of days. 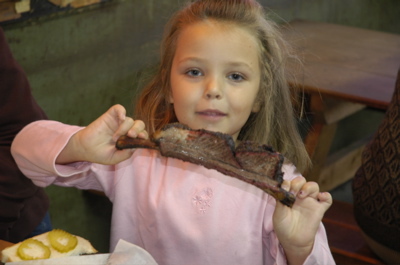 If that interests you, check out the Texas BBQ Trail website. Shanta also took us down to a hidden spot by the railroad tracks, called Taylor Cafe hides in one of the oldest buildings in Taylor, literally a corrugated tin shack that you would never think was a restaurant from the outside. You’d also never think it was the souce of one of the top 20 best dishes served in the USA, according to a New York food writer. Ah, but it is “¦ and some fine food comes out of there. Taylor Cafe has two entrances, from the days of segregation, one on either side of the building. Although it is obviously no longer segregated, people still tend to stick to one side or the other. The interior is reminiscent of a fishing shanty, with exposed plywood on the walls. A big central bar is where you order. 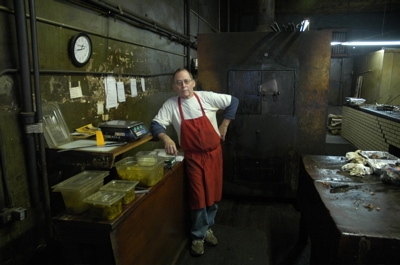 You don’t come here for the dÃ©cor, you come because Vincel Mares has been making barbecue here for over fifty years. When he decides to make something special, like a batch of pork sausage, you’d better be in line the first day or two because after that it will be gone. I shook his gnarled hand, obviously crippled with arthritis, and listened to his quiet voice as he smiled and talked about his food. It’s his life. Every day he gets up at 3.am. to cook, and goes to bed late at night, getting only a few hours sleep before he starts over again. There are regulars in this place who come every day to eat his food. Taylor TX — a worthwhile stop along I-35. The highlight of today was grocery shopping, which is remarkable coming from me. I normally hate grocery shopping but the Whole Foods Market in Austin is definitely one of the exceptions. This place is amazing. Eleanor has a culinary arts degree and I like eating good food, so the combination can be dangerous sometimes. This was one of those times. We went nuts, trying samples and buying all kinds of things. I grabbed some terrific nectarines and “pink navel” oranges while Eleanor shopped wild mushrooms and peppers. 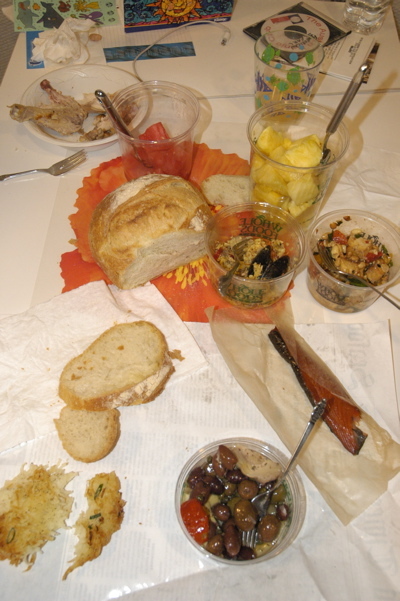 Then we bought smoked salmon, seafood paella (rice with seafood), kung pao tofu, fresh cut pineapple, watermelon, potato latkes, olive & artichoke antipasto, French boule bread, and a pint of chocolate gelato. That was our smorgasbord dinner. Yum. We also bought ingredients for Eleanor to make something Mexican for the potluck dinner this Saturday, since that’s the theme the “campout” organizers have announced: tomatillos, chipolte peppers, corn, bell peppers, onions, limes, and various Mexican spices. She’s making a roasted corn salad. We also bought a lot of other things we love: Maytag blue cheese, chocolate milk (something I don’t digest well, but I can’t resist), dried cranberries, Turkish apricots, roasted cashew butter, freshly roasted coffee beans (still warm! ), a chocolate truffle dessert, china black rice … mostly stuff you can’t find at the remote grocery stores we usually shop at out in the boonies. So we’re stocked with goodies for a while. Between the staples we bought before going to Big Bend and the Whole Foods spree, this Airstream is loaded with enough food to keep us in gourmet heaven for weeks. It’s not just weenies and beans when we travel! Texans pride themselves on being friendly. So it was no surprise that about a dozen Airstreamers showed up to join us at the Salt Lick tonight for dinner, and they all seemed to have a great time. After some excellent barbecue, there was a cry from the rabble-rousers for me to make a speech, so I stood at the end of one of the picnic tables and did a little Q&A about our trip. Being mostly retired folks, and all Airstreamers, they were completely in sync with our thoughts and ideas about traveling the country. Again and again I heard “It’s so great that you are doing this with your daughter,” and “The magazine is great — I hope you are doing well with it!” It was a great evening for my self-confidence, and I think Eleanor also enjoyed the affirmation. We talked for about an hour after dinner, covering homeschooling (everyone seemed to think it was great, even the grade-school principal), magazine publishing, travel tips, lifestyles, and domestic bliss. I expect a similar scene this weekend at the rally in Cleburne, and again next week. I have been invited to speak at the Region 9 Computer Rally next week about our Tour, so it may be time to develop a regular speech. Otherwise, I can ramble on all night! We have lined up Dometic, Shurflo, Zip-Dee, Airstream, Fantastic Vent, Reese, Vintage Trailer Supply, and George M Sutton RV as sponsors of the ’52 Cruiser project, which is tentatively called “Vintage Lightning”. The project is looking good, but we are going to be pressed to have it ready for the International Rally in June. Anyone who might be able to tow it one-way from New York to Oregon this June, let me know! We may need some help there. The solar system for our Tour trailer is being designed now with the help of Triangle Electric in New York, and I hope to help install it in early April while we are in Florida. Right now we are planning on four 110-amphour AGM batteries, three 130w Kyocera solar panels, a Xantrex inverter, and a charge controller. We are also working on design of some custom cabinetry for the Safari to hold our laser printer, some Zip-Dee chairs, laundry, recycling, books, and misc. I am hoping to find someone who can build and install it while we are in Florida, but right now don’t have anyone in mind. I’ve got to put in a full day on the magazine tomorrow but if we can we’ll take the evening to go into Austin and enjoy the new balmy weather and perhaps a bit of live music.